Ron Dennis, the man who was once synonymous with McLaren after leading the team to seven constructors’ championships and 10 drivers’ championships, is now completely done with all of McLaren, per WTF1. Dennis just sold his remaining shares in the company and gave up his position as director of the McLaren Technology Group and McLaren Automotive. This ends a 37-year run at McLaren for Dennis. He was pushed out as chairman and CEO of McLaren last year by the other shareholders of the company. Now Dennis says that he’s reached an agreement with those shareholders to leave McLaren’s boards entirely to “focus on other interests,” per a statement provided to WTF1. Dennis is 70-years-old, so it’s about that time anyway. Dennis’ shares were sold to two of McLaren’s other main shareholders: Mansour Ojjeh and Bahrain soverign investment fund Mumtalakat, notes the BBC. It was a disagreement with Ojjeh that led to Dennis’ departure as chairman and CEO of McLaren last year. The McLaren Technology Group (which includes McLaren Racing) and McLaren Automotive will be merging together under a new company called the McLaren Group after Dennis’ departure. The two were largely functionally separate before. Mumtalakat representative Sheikh Mohammed bin Essa Al Khalifa taking over as executive chairman of this new McLaren Group. 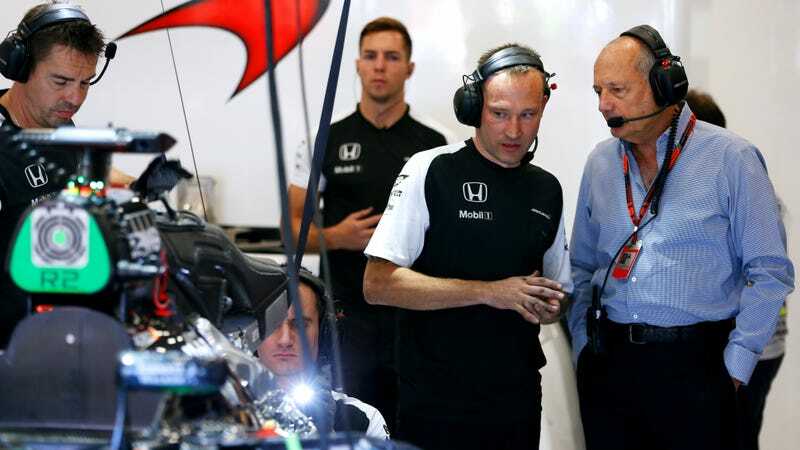 Of course, while Dennis is credited for much of McLaren’s success in the past, he was also a key figure in scoring McLaren’s current wildly unsuccessful deal with Honda to use Honda engines in their cars again. McLaren’s been left trying to get out of that one all year in hopes of making a deal for an engine that actually works. Please, Won't You Give This Poor, Struggling F1 Team An Engine?